Do Guinea Pigs Like the Dark? One of the mistakes that we as owners make (ok, its just me!) is thinking guinea pigs are a lot like us. In some ways they are in the way that they behave but in other ways, they very much have their own characteristics. When it comes to whether guinea pigs like the dark or not, they are quite different to us. Guinea pigs are quite comfortable living in the dark and have eyes that adjust very easily to dark spaces. 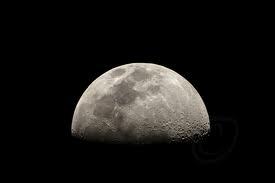 They can move around quite freely and are not inhibited by the fact that it is a dark space. This is because as prey animals, they need the ability to move around tunnels and holes easily and at pace, so they do not struggle with dark spaces at all. In fact I would say that they prefer darker shaded places more than places of sunlight. In the summer when it was very hot, they did not like being out in he sunlight and would always look to retreat to the shady areas. I have also experimented with them being in darkened rooms and they are still happy playing Chasing around. So if you are wondering for example whether you need to leave a light on for your guinea pigs, the answer is no you don’t have to. They are quite happy with the dark and can see better than we can in it. So if you have a pet guinea pig or two, then what is the best way to let them get some exercise? You could leave them in the hutch or cage and hope that they get the exercise they need. You could let them run around free in your yard, to give them the space and freedom they need. However, they are liable to chew on anything they take a fancy to including plants, and are also likely to escape through any holes you have in fencing. Although they are not the fastest of runners, they do take some catching once they have got a head start ahead of you. You could get a leash for them, but they are uncomfortable for the guinea pig and pretty inhumane. 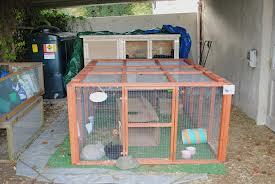 Instead, if you have the space, it is a good idea to create a run for your guinea pigs. Guinea pigs are naturally used to running wild and exploring in long grass so giving them space to run around is highly appreciated by them. Treating a guinea pig well and giving them variety in their day is something that really adds to a guinea pig’s quality of life. Imagine being stuck in the same place all day and all night. Personally I would go mad. So giving them somewhere to run around adds a nice dimension to their day. It gives them the chance to exercise, graze on grass, and get fresh air. This is especially nice, if they are usually housed inside. 1. The traditional type is a wooden frame guinea pig run upon which wire mesh is wrapped around. It doesn’t have a base and so allows the guinea pig to graze on the grass. It is also mobile enough to be moved around the yard from place to place. This is also nice for the guinea pig as they get to sample different areas and chew new grass. It also saves creating a build up of droppings in one particular area. 2. 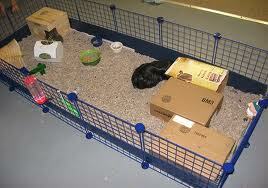 You can also buy metal animal cages that can be used as runs for the guinea pigs as well. They provide ample space for your guinea pigs and are just as good as a wooden framed guinea pig run and can even be more flexible as most can be folded away very easily. They are also very quick and easy to assemble and disassemble and easily stored. 3. There are also nylon runs that you can purchase that are more modern and give your animal more cover than their metal/wood counterparts. 4. If you are looking for a guinea pig run on a budget, you can construct one yourself. Basically look to construct somewhere that gives the guinea pig a boundary, some good space to run and to graze as well. This can be constructed of anything that will keep them within the run and owners have been innovative in constructing runs that will give their guinea pigs a good run around, but not have to spend funds on an expensive ready-built run. This is how one owner has approached this. She bought most of the materials on ebay. 5. 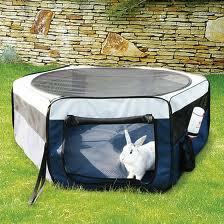 If you have an enclosed space on your property that you can use then this can also be used as well. We have a patio area that we use for our guinea pigs to run around. It is nice and enclosed with low walls surrounding it and is ideal. The only thing it doesn’t provide is grazing area, so we have to provide grass and hay for them to chew on. 6. Owners have also used child’s plastic paddling pools which are cheaper alternatives and can be purchased from toy stores. As long as they allow your guinea pigs to run around, then that is an alternative. Just make sure to provide grass and hay. 7. An Indoor guinea pig run. If you do not have a yard or weather restrictions mean that you cannot let your guinea pigs go outside, then c&c cages are great indoor guinea pig runs and give the guinea pigs a great deal of space to run around in and ensure that your guinea pigs are happy. They are the choice of many satisfied guinea pig owners and will ensure that your guinea pig is happy in their home. 8. If you are looking to set up an indoor guinea pig run on a budget, you could also set aside a room in your home so that your guinea pigs can run around it. They will really appreciate the space that you provide. You could also section a space off in a room so that a clear boundary is set for your guinea pigs if space is an issue. Give them somewhere to retreat to. Wherever you have the run, make sure you put somewhere for the guinea pig to retreat to such as a cardboard box. They are domesticated animals and so being out in the wild too much can make them frightened, so having a place to retreat would be appreciated by the guinea pig. Make sure that there is not too much space for the guinea pig to escape. By being vigilant you can ensure that your guinea pig stays inside the run and predators also can’t get in. When outside they need somewhere so they can retreat from the rain and the sun. Guinea pig’s do not like being in the rain and also direct sun light and , and much prefer shade, so placing some sheeting over the run at one end will provide a nice retreat from the natural elements. Make sure you can get access to the run as well. Some runs give you access from the top by way of a hinged trap door which can be fastened. At the end of the day, bring the guinea pig’s back into their usual home. Get them back in their cage at the end of the day. Leaving them out at night will scare them and also leave them open to being attacked by mice, rats or other animals such as foxes. Give them boredom breakers to play with. They will also really appreciate things to run into and to hide instead of just having an open space. You can do this very cheaply by using old boxes and tubes which they will love to play with. Why not let them run around all the time? C&C cages are great for this and the example above with the paddling pool allow the guinea pigs a chance to stretch their legs any time they want. Although a good guinea pig cage should give them enough space to wonder around, having a run attached will ensures a much happier guinea pig. Whatever run you decide to go with, your guinea pigs will really appreciate it and be much happier that you have given them somewhere to run and stretch their legs. Every so often you may wish to add a Guinea Pig to your pack. However introducing the Guinea Pig straight away to its new friends is often not the best thing to do. The reason for this is to ensure that it does not have any illnesses or diseases that could possibly be passed onto the others. What kind of quarantine gap does there need to be? It is often thought that there needs to be a gap of about three weeks between getting the guinea pig and putting it with the others. This will give you enough time to assess whether the new Guinea Pig is in a fit state to join the rest of the pack. You can also assess their behavior and character during this time as well and make arrangements if you feel there are going to be any potential conflicts. Once the three weeks have passed then put the new guinea pig in a cage which is next to its new mates for a period of a few days. This will give them time to get used to each other smell even though they won’t be able to get close to each other before they actually meet face to face. When you do introduce them, it is best to take a different plan with sows to boars. With both sows and boars, they can be introduced during floor time. However, with boars, make sure you do this on neutral territory so they don’t fight. If you feel that your guinea pig is definitely free of illness and disease having come from a reputable breeder and it is a young guinea pig, then you may feel that you a time of quarantine is not necessary. A good way to find this out is to rub the new guinea pig with some bedding that has been soiled from its family and put it in the cage with the new guinea pig. The reason we are doing this is that younger guinea pigs will tend to pine if left alone and could die. If you do find that there is still more trouble from this fast introduction then introduce another young guinea pig and put the two together. A period of quarantine can often be a very helpful way of introducing a Guinea Pig to its new pack. Done well, it can ensure a Guinea Pig begins life its new home well and settles in with its new pack as best as you can make it. In the third of this part series looking at what to do when your bringing home a guinea pig, we look at the whole process of settling a guinea pig in to your home. There are some good things that you can do to ensure that the guinea pig feels well settled in its new surroundings. When you get the guinea pig home, try not to pass it around from person to person in the first couple of days. It is better if just one person holds and cuddles the guinea pig for a few minutes at a time so it can gradually acclimatize to its new surroundings. The guinea pig can also get used to your scents and begin to feel safe. It should begin to feel at home after a few days. Because it is in its new home, the guinea pig will need some time to get used to its new surroundings. However, don’t leave the guinea pig in the cage and leave it for a period of time like a week or so as it wont know you and so will be harder to catch if it escapes and hides. 3. Get used to handling your Guinea Pig? Handle your Guinea Pig gently two to three times a day. This way it can get to know you and become used to who you are and what you do. After a few weeks or so, the guinea pig will soon come to the front of the cage to meet you when you visit. if you are lucky, they’ll do it sooner. Always go to handle the guinea pig with the intention of being gentle. Never hold the guinea pig by grabbing the scruff of its neck. If you grab it from above and squeeze its ribs, it can really hurt the guinea pig. The lower part of the guinea pig is also very vulnerable to handling. When handling a guinea pig, slide one hand under the tummy and rest the other hand on the back. If you guinea pig wriggles quite a bit you can slide your hand underneath its backside and this will settle it. Be as quiet as you can and you shouldn’t have any trouble. Do not entrust a child to handle the cavy as they need delicate handling to begin with. Regularly check the guinea pig’s teeth. Make sure any food is chopped up so that it can pick it up with its lips and pass it back to its grinding teeth. The guinea pig is also susceptible to broken teeth if it is dropped. In the second part of this series we look at what do before and after you arrive home with your Guinea Pig. Do you house the guinea pig in a cage or do you have a hutch that the guinea pig can stay in? They will need about 7.5 square foot of space each, which is a rough guide to the kind of cage you need to think about. Also think about where you want to put the cage. Obviously it needs to fit around your family requirements but what also needs to be brought into consideration is that Guinea pigs are very social animals and being on their own is not good for them. If you can, having them around your family will be very beneficial for them. If you have any pets in your home , think about whether they can handle having another pet in the home. Some may feel threatened by this so do take this into consideration for the benefit of your guinea pig and the present pet. Make sure you get enough food in for the Guinea Pig. What i have found with Guinea Pigs is that they are always hungry and never tire of eating. So it is worth having a stock of food to feed your guinea pig. Get some guinea pig food from a pet store and a stock of vegetables such as carrots to feed your Guinea pig. Lettuce is also a favourite and worth stocking up on. Purchase a water bottle as one of the first thing s you do so the Guinea Pig does not get thirsty and fill it and attach it to the side of the cage in an accessible place that it can get to it easily. It is worth purchasing some hay to lay down in the cage for the Guinea Pig to eat and to make its bed on. Guinea Pigs need exercise and love to run. Have a place where they can run around in. 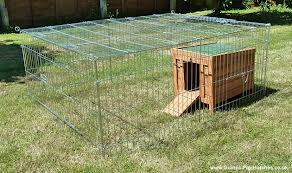 You can also purchase large grids that you can place on grass that will allow the Guinea Pig to run around in. When you get home and you have its cage all ready to go, carefully lift the guinea pig out of the carrier and give it a good cuddle. After a few minutes of holding it, place the guinea pig in the cage and shut the door. Believe it or not, talking to the guinea pig will help it acclimatise and get to know your voice. This is important for the guinea pig in getting to know its new surroundings. If you are looking to bring home a Guinea Pig then there are several types of Guinea Pig carrier that you can use to transport it home. If you have an older Guinea Pig or two youngsters then a cardboard box about the size used for six wine bottles is appropriate. Ensure that the box is securely taped up and is secure on all sides that the Guinea Pig could not fall out. If you have a cat or dog carrier, then this could be used to bring the guinea pig home. Just ensure that the bars do not have too much space between them that the Guinea Pig could escape. You can purchase purpose-built cages at any good pet store that will be good enough to bring your new Guinea Pig home with you. There are many good animal cages on the market, offline and online, so check out a good one in your area or by searching online. That it’s a good size for the Guinea Pig to move around in. Some Guinea Pig owners have professed to using a laundry basket which is lined with a blanket, newspaper, and hay. If you do this then ensure that it is deep enough that the Guinea Pig won’t escape. Another idea is to use a picnic hamper that has plenty of small holes in for ventilation to transport your Guinea Pig’s new home. The basket-type picnic hamper’s are good as they have plenty of gaps for ventilation plus have a secure fastening. Has few vegetables such as carrots for them to nibble on and keep them occupied. Ensure that the Guinea Pig can breathe by providing ample air holes if its a sealed container and ensure that there is a lid to the container. Keep the container sealed until you get home. Don’t attempt to walk with the guinea pig in your arms or travel with it like this in the car or bus. If the cavy attempts to escape, it could injure itself in the process by falling. Cater for safety above all other things and you won’t go far wrong. Try and keep the temperature as cool as possible and remember that guinea pigs prefer shade to being exposed to sun rays. If you are using a cage or dog/cat carrier then you may want to also think about attaching a water bottle to make sure the guinea pig does not get thirsty.